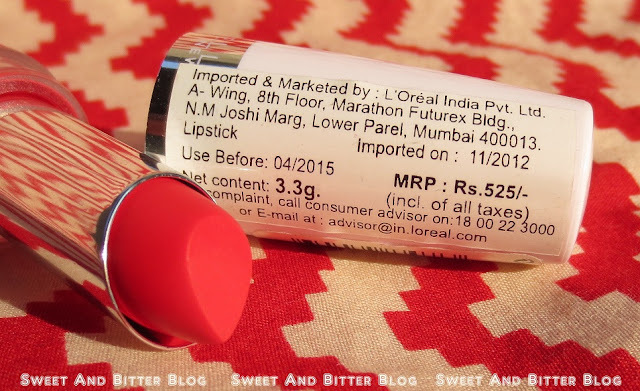 How many long wear, forever stay, infinite wear, etc etc lipstick are there in the market? Infinite. You have any trust on them? Not so much. 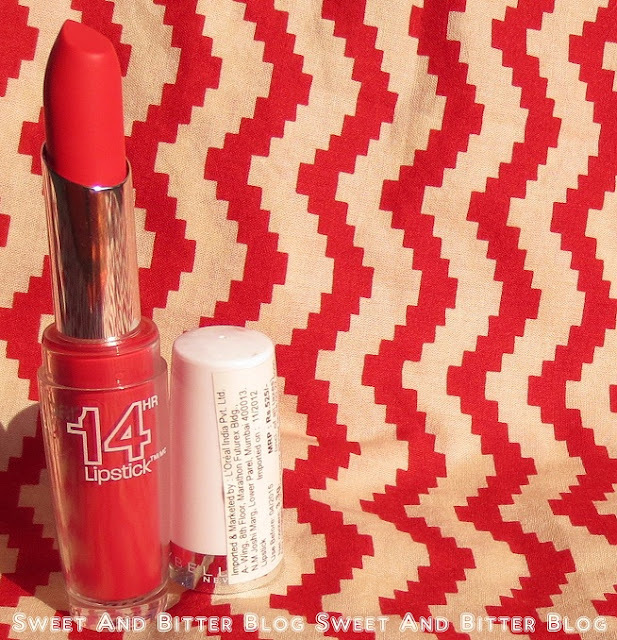 So, when I heard of the Maybelline 14 Hours Lipstick, I just rolled my eyes – Another huge claim…blah blah. But then the shopaholic in me just cannot say a NO. Especially, when there is a flat 15% off on all Maybelline products. Can she? So, I jumped on the only product that I do not have from Maybelline. I was bored with Infinitely Fuchsia, Keep me Coral and another Coral one because I was seeing it everywhere. 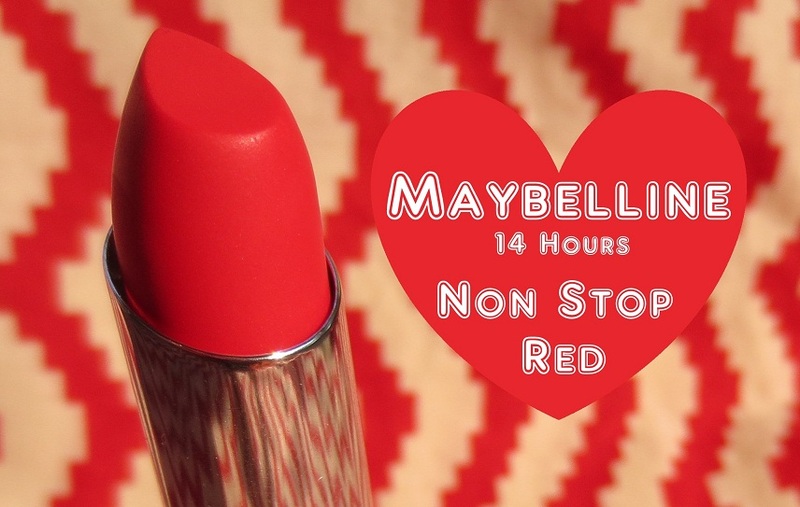 I needed something different and then I found – Maybelline 14 Hours Lipstick Non Stop Red. You can read details about these lipsticks collection here. Color – It looked like a bright reddish pink but it was not that. Damnn you stupid store lights! Actually its a pinkish red. Stay - Does it stay on for 14 Hours? I applied it yesterday around 4 PM. It looked nice and so, I skipped swatching the MAC lipsticks on lips and keep it on. I had French fries and omelet at evening. I thought it must have worn off. I forgot about this completely. Right after my dinner of oily Indian food with rice, I looked at my face. I was shocked – Full color with 90% intensity with only slight signs of wearing off. No bleeding, NOTHING. I did my regular cleansing at night avoiding the lips. Washed my face with water. At 1 AM before going to sleep, it was there! I took the challenge and went to sleep with the lipstick (please never do this!) I woke up to see lot of tint to be still there! I had to use a sugar scrub on lips to remove it and a bit of it was still there! I have to say this – I AM SUPER IMPRESSED. The lip color is light and you can just forget about it. I would have not even realized that I had this on unless I had looked at the mirror. Surprisingly, it survived food! I am the biggest lipstick eater and lipsticks hardly last though meals. I was expecting it to be of drying quality. I didn't apply any lip balm, etc underneath or over it but I didn't give me flaky lips though I wore it even over night. It was not even much drying compared to the general long stay colors. Maybelline has a super stay lip color long time back which I brought during my student years. It was good but extremely drying. It felt like paint on lips. It used to wear off like paint peels. YUCK! This however is a HUGE improvement over that one. Transfer Resistant - This is not 100% transfer resistant when freshly applied. I tested it again on a porcelain cup before going to sleep and it passed with flying colors. Smell - It has sweet cherry type smell but that does not last long. Packaging - I really hope it was better. Its does look bit cheap with that white plastic cap. Price - 525 INR. Maybelline is having 15% off on all products at most counters. I got mine from Shoppers Stop. And, if you purchase more than 1200INR then 20% off. Overall - For the price I paid and how the product worked, I have to give it full 5 STARS. 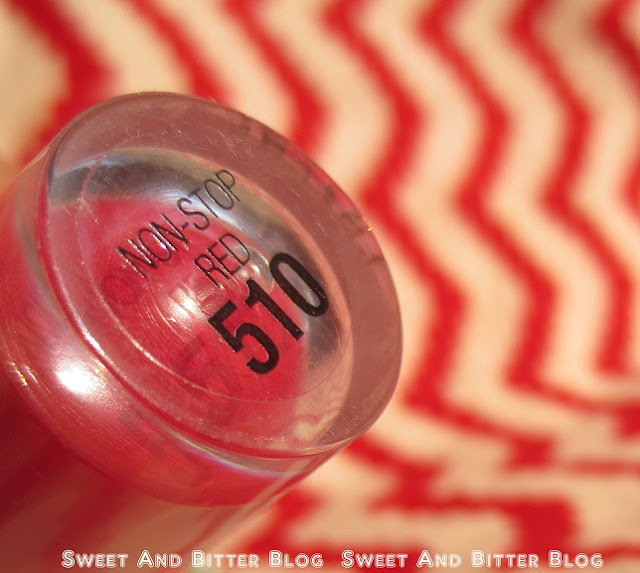 I have to say this – If you ever had issues with lipstick staying on your lips (who doesn’t have?) then please BUY ONE NOW! There are 20 colors to select from and I hope you find your match. lovely color!!!! i too have them & i totally love them! You actually slept with it? Wow, that's dedication towards the readers ;). Nice review and lovely colour. I really gotta BUY IT NOW after reading this review.. heading tomorrow. Now this is one hell of a keeper, love the color, currently on the hunt for a red that will suit me, looks like this must be the one!!! wow, that's a very pretty pinkish coral red color!